was about to make a big leap. She and her husband had decided on a whim to sell their home in Canmore, Alberta and move to the Comox Valley, a place that neither had ever been. It was two weeks before moving day, and Santos was starting to get nervous. That’s when she discovered a brand new website called Our Big Earth (www.ourbigearth.com), a site dedicated to showcasing all that the Comox Valley has to offer for young children and their parents. The site, which was launched officially in October, provides informative columns on a variety of children’s topics, forums where moms (and dads) can ask questions or share their own advice, downloadable coloring sheets and lots more. Most importantly, at least to an uncertain mom about to pack up and move to an unknown community, Our Big Earth contains a ton of kid-centric resources on the Comox Valley, such as a trail guide, restaurant reviews and a comprehensive list of kid-friendly activities. Our Big Earth is the brainchild of Robin Rivers, a young mother who relocated to the Valley two years ago and knows how hard it can be for parents to settle into a new community. Apparently she’s not. In March 2007, Rivers began writing a blog in which she discussed all of the children’s activities she was gradually discovering in the Comox Valley. By May, her blog was receiving 15,000 hits per month, and she realized it was time to take the project to the next level. With the help of her husband, art director and concept illustrator Ken Henderson, she started working on Our Big Earth. With the expanded platform, illustrated with Henderson’s colorful cartoon drawings, Our Big Earth received more than 33,000 page views in its first month. Helping parents, especially mothers, connect is a large part of what Rivers is trying to accomplish with Our Big Earth. Through the site, she organizes a free neighborhood walk program where up to 45 families can explore Comox Valley locales like Morrison Creek, Lazo Marsh and Comox’s Mack Laing Nature Park. While the children enjoy experiencing nature with other kids, and recording their observations and discoveries in complimentary hand-made journals, the parents likewise benefit from the camaraderie of the organized walks. Getting kids outside is the second major objective of Our Big Earth. While Rivers admits that living in a rainforest can be “brutal” at times, she truly believes that braving the winter elements and getting kids outside is always worth the effort. Rivers, originally from Colorado, has spent most of her adult life bouncing around the United States working as a reporter for newspapers in New Mexico, Kansas City and Chicago, to name a few. Six years ago, she met Henderson online while living in Seattle, and the two were engaged about a week later. After the arrival of their daughter Mhari the young family relocated to the Comox Valley, Henderson’s childhood home, and hasn’t looked back since. Rivers still writes every day, only now she writes about things that are dear to her heart rather than about the macabre details of serial killer trials. Working on Our Big Earth is therapeutic, she says, and is truly a labour of love. Which brings us to Rivers’ third main objective with Our Big Earth—socially conscious parenting. The website’s tag line reads “Empowered Families—Inspired Communities,” which offers a quick glimpse into the Comox Valley that she envisions. That said, however, Rivers admits that she’s just like every other mom, dealing with the same day-to-day issues and realities as any young family while trying to keep an eye on the bigger picture. “I’m a pretty normal parent, I really am,” she says. “We eat at McDonald’s, we shop at Wal-Mart, we do all the things that normal parents do. I don’t have any delusions about being Supermom. My kids eat sugar, there’s plenty of junk food in the house and the TV goes on every afternoon. My big secret is that we go outside every day, and that makes a huge difference. Rivers has high expectations for Our Big Earth. She plans to launch a literacy project sometime in 2009 whereby children’s books would be bought from publishers and distributed to kids throughout the Comox Valley. Her goal is to put together a program where every child under five can receive a free book every month. She also hopes to take on a charitable project to benefit children in developing countries, and she’s even exploring the possibility of eventually exporting the Our Big Earth model to small communities across the country. With such lofty aspirations, it’s refreshing to know that Rivers intends to continue offering all of the site’s myriad features free of charge, with her costs covered through advertisers and sponsors. It’s also inspiring to learn that she donates a portion of all advertising revenues to charities such as YANA, Canuck Place Children’s Charity and Doctors Without Borders Canada, which she also plans to continue. Rivers’ optimism, and her drive to keep improving the site every day, stems from the incredible support that she’s received from the community so far. As for Nadine Santos, the recent transplant from Canmore, she couldn’t agree more. In the few months since arriving in the Comox Valley, she’s already made countless friends through Our Big Earth’s neighborhood walks and through the many “diaper gyms,” or children’s playtimes that she’s discovered through the website. 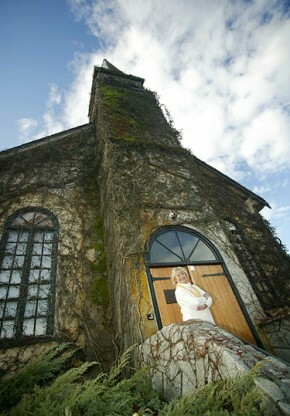 Marlene Oolo takes a break from her busy volunteer schedule outside the Old Church Theatre in Courtenay. who seemed unable to express the serious demeanor expected of a ballerina. As one of only two British Columbians chosen to join the fledging Toronto-based company in 1954, generic Marlene tried her best to please the strict ballet mistress. But stop smiling? You might as well tell the sun to stop shining. That smile—warm, welcoming and contagious—is familiar to many in the Comox Valley who have come to know Marlene York Oolo over the past 11 years. They see her in Co-Val productions or painting children’s faces at the Filberg Festival, serving coffee in the Evergreen Seniors’ kitchen and selecting groceries for Thrifty’s Sendial program, on the board of the Community Arts Council and either in the audience or behind the scenes at almost every theatrical production around town. No wonder she was named Volunteer of the Year in 2002. Yet few know the scope of this woman’s artistic experience. Oolo’s (pronounced oh-low) overwhelming talent and ambition became evident early in her South Burnaby childhood when, given money by her mother to pay for piano lessons, she spent it instead on dancing lessons. Ethnic dance came first, befitting her Polish-Ukrainian heritage, then Scottish dance. Soon, having won all the awards in BC, Oolo was off to compete in Aberdeen, Scotland. Back in Vancouver and concentrating on ballet under Kay Armstrong’s expert tutelage, she qualified for a career with the National Ballet. But chance intervened. In Toronto, Oolo found room and board with the family of CBC orchestra conductor Howard Cable, whose teenage daughter also danced. One night the two girls sneaked out to a jazz dance class—and Marlene discovered a whole new world. “It was wonderful,” she remembers. “I could turn cartwheels, kick high, laugh and smile as much as I wanted. I decided I was going to go on stage!” Goodbye to the corps de ballet and hello to the chorus line. Now a freelance artist, Oolo began a busy round of auditions and quickly won a part in the musical Finian’s Rainbow. However, like any freelancer she suffered through lean times, so when “resting” Oolo scrubbed her landlady’s floor, cleaned houses, worked as a manicurist or cashier at Loblaw’s and, with valuable sewing skills learned from her mother, altered and mended costumes. Her parents wanted her to come home but Oolo persevered. “I may have been starving but I was dancing,” she says with a laugh. If really hard up, she could always drop into the club Le Coq d’Or to share a sandwich with Gordon Lightfoot, or count on Ronnie Hawkins to buy her hot chocolate and cinnamon toast. But the expanding entertainment scene offered new opportunities. Besides Hockey Night in Canada, the recently formed CBC television network found that variety shows with exuberant comedy, singing and dancing topped the charts. Oolo was soon working with Alan Lund and Norman Campbell on favorites like Juliette, Country Hoedown, CBC Folio, Cross-Canada Hit Parade, the Tommy Hunter Show, and the Jack Duffy Show. So many Canadian performers got their start then: Don Harron, Robert Goulet, Johnny Wayne and Frank Shuster, Moe Kaufman, and later Anne Murray and Ian and Sylvia. Together they formed a line that worked as many as four shows—first they did the Wayne and Shuster comedy hour, then dashed to another studio for “our pet” Juliette, crossed the street to a third studio for Wally Coster and Hit Parade, then raced on to Country Hoedown with Gordie Tapp and the Hames Sisters. “I look back now and wonder how I managed it. Where did I get that energy?” she says. Live TV was frantic and often unintentionally hilarious. When Herb Alpert and his Tijuana Brass appeared, their set was designed to resemble a Mexican village, complete with rustic shanty and a real donkey. All looked fine until someone decided that real chickens would make things more authentic. Her ballet training proved valuable when Oolo danced for eight years with the Canadian Opera Company, pleased to be working again with choreographers Alan Lund and Joyce Gray, and thrilled to be close to famous dance pioneer Hanya Holm. She performed the pas de deux in Rigoletto, and danced in The Magic Flute, Aida, Carmen and The Barber of Seville. In late summer, she joined the Canadettes, the Canadian National Exhibition’s answer to the Rockettes. Even though the showgirls had to deal with rehearsals in the horse barns and the exhausting August humidity, their arrival on stage in elaborate costumes, hair, and makeup made them appear the ultimate in glamour. Big names featured in CNE Grandstand shows, like Bob Hope, Danny Kaye, George Burns, Harry Belafonte, Rosemary Clooney, Johnny Cash, Victor Borge, and others. While most delivered their own routines other starred in musicals, Oolo remembers a marvelous production of Oklahoma with Gordon MacRae, but her most important memory is of Teresa Stratus playing The Merry Widow, for it was there, waltzing to the Vilja Song, that she met her future husband. She married Armin Oolo, a stage manager and design coordinator, in the 1960s, and later had a son, Allan. By this time Oolo was working behind the scenes as well as in front, choreographing CBC-TVs Wayne and Shuster specials and the Toronto Police Games, as well as the Miss Canada Pageant. She crossed the country with General Motors Motorama, and modeled furs for Queen Elizabeth during her Canadian tour. Her longest engagement was with the phenomenally successful CTV variety show, The Pig & Whistle. For 15 years, from beginning to end, lead dancer Oolo joined Tessie O’Shea and the Carlton Show Band in performing hornpipes, jigs, and reels in an oak-beamed British pub. Loyal audiences showed their appreciation of the high spirits and good fun. She credits three women with rescuing her, helping to lift her out of despair and returning her to the healing powers of the arts: Beryl Regier of Co-Val, Lori Mazey of Rainbow Youth Theatre and Deborah Renz of the Sid Williams Theatre. Fortunately these women spotted what is essential in Oolo —that she is a vibrant, outgoing, and generous person who needs to be active, who needs to be involved with people and projects to feel fully alive. They saw how she draws her abundant energy from giving—whether her time, her skills, or simply herself. Friends may warn that the years are catching up and advise her to slow down and take it easy, but to no avail. “There are only two ages,” she says. “Alive and dead.” Oolo is very much alive. Celia Franca may have lost a ballerina all those years ago, but Oolo has not lost her smile. Today it brightens StoryTime at Berwick House, beams on special needs students learning to sew at the Lewis Centre, and cheers the casts of Oliver! and The Producers when she applies her makeup artistry. “I feel how lucky I am to have all these little pockets of family,” she says. Marlene tried her best to please the strict ballet mistress. But stop smiling? You might as well tell the sun to stop shining. As one of only two British Columbians chosen to join the fledging Toronto-based company in 1954, Marlene tried her best to please the strict ballet mistress. But stop smiling? You might as well tell the sun to stop shining. legendary founder of Canada’s National Ballet. She was pointing at 17-year-old Marlene York, who seemed unable to express the serious demeanor expected of a ballerina. The Fanny Bay Hall is rockin’ out. Eight women are sitting in a circle in the middle of the upstairs studio, filling the space with the primal rhythms of Africa, and smiling, smiling, smiling. Even when the women frown with concentration, their eyes somehow keep smiling. 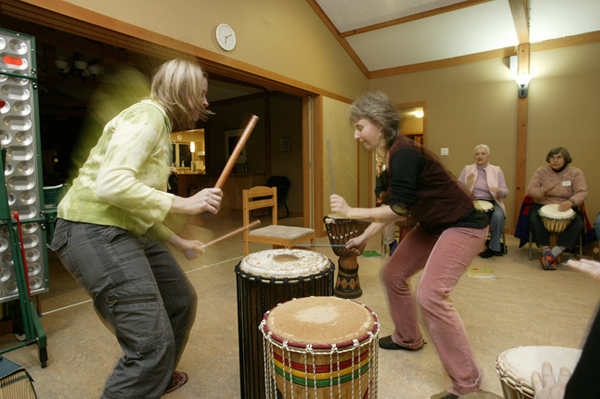 Brenda, Gail, and Nancy are keeping the mother rhythm going with big, steady, satisfying whacks on their big Djembe drums: do da ga do da gi, do da ga do da gi… Jody, Diane and Erna are laying down a top beat, their hands flying between middle and edge of the drum. Anke is creating the pulse on the dunduns, tall cylinders that provide the bass and give cues: boom ba da boom ba da, boom ba da boom ba da. Monica Hofer is at the tall bass drums, calling out encouragement, her whole body bouncing to the beat all the while. She puts down her sticks and bops over to her Djembe, looks around the circle, gathering everyone’s attention as if by magic as she plays the universal beat—the signal that something is about to happen. In unison, everyone switches to the same beat. With everyone playing together, it feels as if the whole room is one big drum. The beat gets faster, the women’s hands fly, the energy gathers. Then Monica calls out, “Now!” and it changes again: Boom-boom, boom-boom, boom! Boom-boom, boom-boom, boom! Boom-boom, boom-boom, boom! Boom-boom, boom-boom, boom! Boom-boom, boom-boom, BOOM! And it stops. The silence is full, palpable, vibrating, and then broken as a few women give out big whoops of joy and the room fills with appreciative laughter. It’s not hard to understand why Union Bay resident Monica Hofer loves her profession as a drumming teacher. As well as running ongoing drumming classes, like the one described above, at a number of Comox Valley locations, Hofer provides drumming programs in schools, leads community drum circles and performs, often with her students, at various events. In all her work, drumming is a pathway to joy, camaraderie, health and freedom. Hofer loves to talk about the many health and social benefits of drumming, pointing out that it has a positive effect on everything from the immune system to employee absenteeism to children’s math ability. There’s even evidence, she says, that drumming on dogs is good for them! But the driving force, for her, is always the power of the experience itself. Drumming is a great way to build camaraderie in a group, says Hofer, and the Drum Divas are a great example. “They are a fun group, a pretty wild and crazy group. They love to drum and they’ve gradually built themselves up to be what they are. They’ve invited friends, and now they’re all friends.” As well as drumming together every Monday, this group occasionally performs at fundraisers and in settings such as seniors’ residential care centres. The power of drumming in groups has been known for millennia. Ancient societies drummed to raise their spirits, communicate, affirm the unity of the group, scare off enemies, release stress, resolve conflict, honor their traditions, heal the sick, and, on top of all that, have fun. But in the last thousand years or so, the industrialized Western world has lost the habit. Luckily, it doesn’t take much to recover the lost art of drumming. A drum circle is an equal playing field, she says. “Everyone feels the same when they start. Even if there are advanced players in a group with beginners, it’s an equal circle because the people who’ve played longer will play something different from the people who’ve just begun. You feel very equal and very safe.” A nice thing about drumming in a group, she points out, is that no one really knows whose drum makes what sound, so you don’t need to feel badly about mistakes. “It’s fun to watch people come out of their shell and realize they can contribute to the circle,” says Hofer.